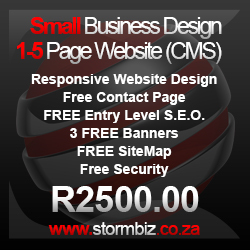 From the 1st October 2013, all websites designed by Storm Biz are Responsive Websites, fully viewable on mobile devices, tablets, desktops and laptops. What is Responsive Websites, why have we moved into this direction, and how does your website, traffic and users benefit from this, and finally what is the cost involved? We use the term responsive website design for websites that have a "different" display on tablets and mobile devices, compared to normal desktops and tablets. 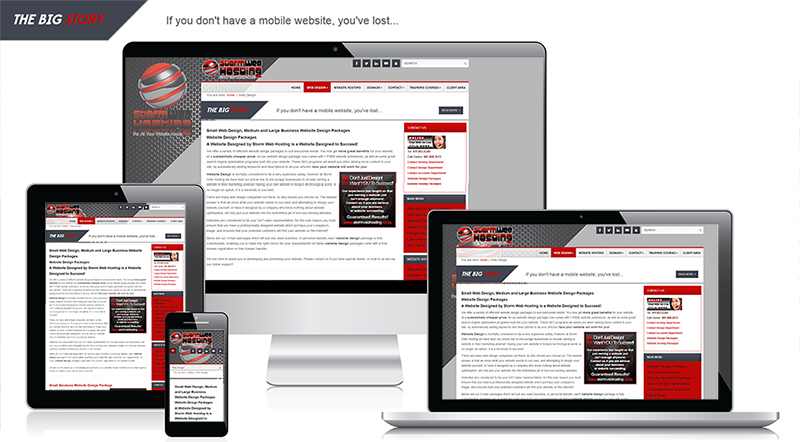 This is not the same as the old "Wap" websites, as the mobile and tablet version still contains graphics, and even image galleries and forms, or any components still found on a normal desktop version, the only difference is that the layout "responds" to the device that you are using, and there is no need to use the "Zoom" function on your phone to make the website readable and images viewable. Users do not want to keep scrolling up, down, left and right to view your content, they want it readable as it displays on the screen, anyone who has used an e-book device will know exactly how easy it is to read content that only scrolls down, and this is essentially what a responsive template creates. Our main objective is still to provide websites which are search engine friendly, displays beautifully on desktops and laptops, and now with the added advantage of displaying correctly on mobile devices and tablets. We have already stated that the need for mobile websites have increased dramatically over the past few years, with more searches being done on mobile devices, than any other devices. Since your website is responsive, your users will not skip your site and move on to one of your competitors whose site is already mobile friendly. This means that your traffic is increased, page hits are increased, and your users are now enjoying their experience on the mobile version of your website. Many people still assume that a mobile website is dull, boring, and contains no graphics, this assumption is incorrect, a mobile version simply compresses your website graphics, text and components into an easy to view style that is fully viewable on your phone, and enhances your users experience. Your users will know that you have taken the time and effort to provide them with a user friendly, mobile version of your website, without losing the quality of your desktop version. At Storm Biz we don't believe in gradually learning how to do things... We jump in to the most difficult website we can do, as this teaches us everything we need to make future designs easier. Well this turned out to be true, as our first fully responsive website turned out to have 9 different coloured themes, 12 different contact pages, 22+ different galleries, and over 30 Content pages. This complex website took us almost 3 weeks to complete. We have since changed our own website and accounting system to a responsive design, this only took us 4 days for both systems. The websites that we now design that are responsive, take an additional 1 - 3 days to design, implement and test (dependent on website and component complexity). 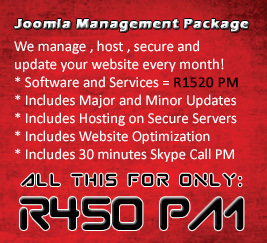 Considering the increase of traffic that your website will now receive, the initial investment is minimal.